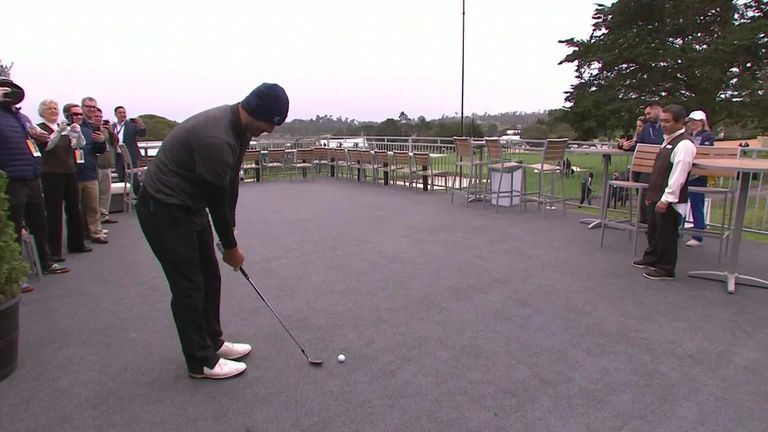 Tony Romo produced arguably the shot of the year so far with an amazing pitch from a hospitality tent during the second round of the AT&T Pebble Beach Pro-Am. The former NFL star, who has made a seamless transition into his new role as a commentator, is well known for his golfing prowess and the scratch handicapper made his PGA Tour debut last year at the Corales Puntacana Resort & Club Championship in the Dominican Republic. Romo is a regular in the star-studded event on the California coast, and he wowed partner Jim Furyk with an astonishing recovery shot on the 15th hole at the Pebble Beach Links in cool and damp conditions on day two. The ex-Dallas Cowboys quarterback found himself facing a tough task just to hit the green, with his ball sitting on the carpet of the hospitality area to the right of the 15th fairway, although it stopped short of rolling into the tented area. After joking with the customers that he had "just come over to say 'hi'", Romo surveyed his line to the green and arranged for the tables and chairs to be moved to one side as he reached tentatively for a wedge. It's the sort of shot we normally only see from the likes of golf's greatest escapologist, Phil Mickelson, but could Romo match the five-time major champion with his short-game skills? The answer was an emphatic "yes", and not only did Romo hit the green, his ball spun back to within 18 inches of the cup to leave him a simple tap-in.